This is an energy/power resiliency service that delivers emergency electricity to power critical devices, equipment, machinery and facilities in the event of utility power outage. This (SmartEnergi Energy Cost Saving Service) is an energy service which allows customers to truly manage their demand to reduce power cost. 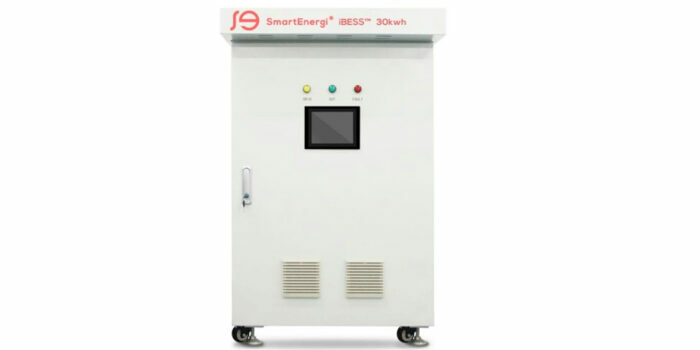 Flow battery based intelligent battery energy storage systems (iBESS™). We select one or combinations of these two intelligent battery energy storage systems (iBESS™) considering the assessment of our customer’s historical critical application needs during power outages. Specifically, we deploy our innovative lithium-ion battery based iBESS™ commonly indoors for critical applications to support sensitive machineries and equipment installed indoors. However, we install the flow battery based iBESST™ usually externally to supply emergency power to the whole facility, building, or an entire community. In general, the deployment process of the two energy services include three components: Signing energy service purchase agreement, installation of our intelligent battery energy storage systems (iBESS™/ micro grids, and timely monitoring. More information about these services are described below. Power outage is a systemic risk with severe consequences, including tangible and intangible economic losses, and interruptions of critical operations that affect governments, businesses and homes. SmartEnergi has designed and introduced a novel energy service called SmartEnergi Power Assurance Services (SPAS™) to address this problem. Under SPAS™, we provide energy/power resiliency to supply emergency power to customers whose operations cannot tolerate electricity supply interruptions due to power outages. Globally, utility power outages could arise for different reasons, including but not limited to planned outage, natural disaster, and international and national saboteurs. These outages generally have harmful effects on meaningful residential life, business operations and government services. For example, power outage could cause hospital/clinic equipment failure and loss of reputation and/or liabilities from loss of lives; business equipment failures could result in loss of critical electronic data, loss of revenue, and increase anxiety and dissatisfaction of customers; and the unavailability of government services due to power failures can cause anxiety and dissatisfaction of the general populace. With SPAS™, customers will have flexible, faster and cheaper way to utilize our energy resiliency services to supply emergency power to support critical operations that can save lives, protect critical electronic data, protect asset values, prevent avoidable economic losses and avoid customer anxieties during periods of national/central power outage either due to natural disaster or man-made terrorist attack or hacking into the system by bad actors. Under SPAS™, we design, own, operate, and manage energy resiliency micro grids/iBESS™ (independent battery energy storage systems) for emergency backup power supply for a small monthly fee, thereby enabling our clients to maintain critical operations during grid power outage. Customers increasingly face high electricity cost due to high demand charges and increase utility adoption of time-of-use rates. Installing appropriate energy storage systems with or without solar or wind turbine provide an opportunity for commercial, industrial, government, defense, educational and residential customers to shift their demand and reduce electricity cost. Our intelligent battery energy storage systems (iBESS™) can be automatically set up to store energy during the off-peak times and deliver energy during peak demand hours, thereby helping minimize the impact of high demand charges and high time of use rates. Like our SPAS™ service, our Energy Cost Savings Services (SECSaS™) include SmartEnergi design, ownership, operation, and management of micro grids/iBESS™. However, we are flexible about the business model, including shared savings.